American postcard by The American Postcard Co. Inc., no. 767, 1983. Photo: publicity still for the TV series Cheyenne (1955-1962). American actor Clint Walker (1927-2018) with his broad shoulders and slim waist started the Western craze on TV in his role as Cheyenne Bodie in Cheyenne (1955-1962) almost single-handedly. Clint Walker was born Norman Eugene Walker in 1927 in Hartford, Illinois. He was the son of Gladys Huldah (née Schwanda) and Paul Arnold Walker. He had a twin sister named Lucy (1927–2000). At 16, Walker left high school to work at a factory and on a river boat, then joined the United States Merchant Marine at the age of 17 in the last months of World War II. After the war he worked his way cross country, including working in the oil fields in Brownwood, Texas, and wound up in California, where he worked as an undercover agent for a private detective agency on the Long Beach waterfront. After a while he took a job as a security officer at the Sands Hotel in Las Vegas. It was there that he met quite a few Hollywood people who told him that his size, physique and good looks would serve him well in Hollywood and that he should go to Los Angeles and give it a try. Walker became a client of Henry Willson, who renamed him Jett Norman and cast him to appear in the Bowery Boys film Jungle Gents (Edward Bernds, 1955) as a Tarzan-type character. He was then hired by Cecil B. DeMille to appear in The Ten Commandments (1956). Someone from Warner Bros. saw the film, found out that Walker was under contract to producer Hal B. Wallis, and auditioned him for a new Western TV series. 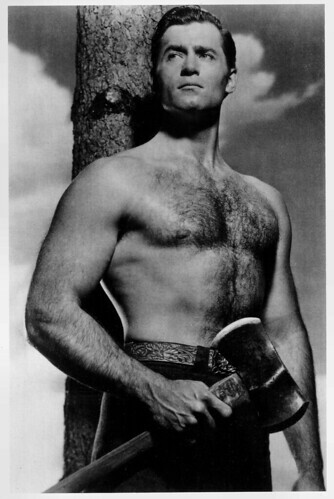 Clint Walker's good looks and imposing physique helped him win the lead role in the TV series Cheyenne (1955). He was cast as Cheyenne Bodie, a roaming cowboy hero in the post-American Civil War era. Cheyenne originally appeared as part of Warner Bros Presents rotating with adaptations of Kings Row and Casablanca. Cheyenne turned out to be the break out hit for Walker. While the series regularly capitalised on Walker's rugged frame with frequent bare-chested scenes, it was also well written and acted. It proved hugely popular for eight seasons. Walker's pleasant baritone singing voice was also occasionally utilised on the series and led Warner Brothers to produce an album of Walker doing traditional songs and ballads. Warners also cast Walker in the lead of a Western feature film, Fort Dobbs (Gordon Douglas, 1958). Box office returns were modest. Warners tried him in another Douglas-directed Western, Yellowstone Kelly (Gordon Dougals, 1959), co-starring Ed Byrnes from another Warners TV show, 77 Sunset Strip. It was a minor success. A number of Cheyenne episodes were cut into feature films and released theatrically in some markets and Walker guest starred as Bodie in an episode of the TV show Maverick. Warners tried Walker in a third Western feature directed by Douglas, Gold of the Seven Saints (Dordon Dougals, 1961), this time co-starring Roger Moore, who was also under contract to Warners. Cheyenne ended in 1962. Post-Cheyenne, Clint Walker had a supporting part in the Rock Hudson-Doris Day comedy, Send Me No Flowers (Norman Jewison, 1964). Frank Sinatra cast him in the war time drama None but the Brave (1965), the only film Sinatra directed. After doing some guest appearances in The Lucy Show he fought a grizzly bear in Paramount's Western, The Night of the Grizzly (Joseph Pevney, 1966) with Martha Hyer. He starred in a family adventure movie shot in India, Maya (John Berry, 1966). Walker had his biggest hit to date when the played the meek convict Samson Posey in the war drama The Dirty Dozen (Robert Aldrich, 1967), starring Lee Marvin. Walker returned to Westerns with More Dead Than Alive (Robert Sparr, 1969) with Vincent Price, and had supporting roles in two comic Westerns, Sam Whiskey (Arnold Laven, 1969) and The Great Bank Robbery (Hy Averback, 1969). Walker was one of many names in The Phynx (Lee H. Katzin, 1970). In May 1971, he was involved in a freak accident at Mammoth Mountain, CA, when the tip of a ski pole pierced his heart. He made an amazing recovery and was back at work filming in Spain two months later.He supported Telly Savalas in the British-Spanish-American biopic Pancho Villa (Robert Sparr, 1972) and starred in the short-lived TV series Kodiak (1974), playing an Alaskan patrolman. He also starred in the made-for-television cult film Killdozer! (Jerry London, 1974) . His later films included The White Buffalo (J. Lee Thompson, 1977) starring Charles Bronson, Deadly Harvest (Timothy Bond, 1977) and Mysterious Island of Beautiful Women (Joseph Pevney, 1979). His later roles were mostly minor, but in 1998, he voiced Nick Nitro in the animation film Small Soldiers (Joe Dante, 1998). Then he retired. Clint Walker was married to Verna Garver (1948-1968), Giselle Hennesy (1974-1994) and Susan Cavallari (1997-now). He had one daughter Valerie (1950) with Verna Garver.